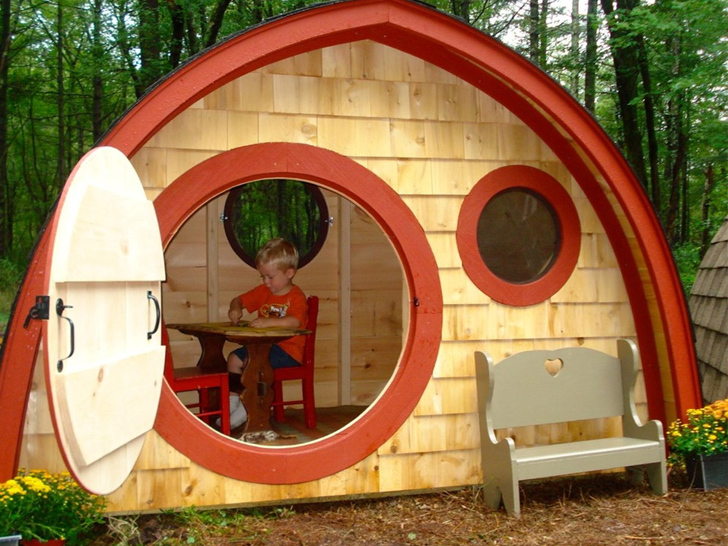 Getting your child out of the house and into the great outdoors can sometimes be a challenge, but these delightful playhouses from Wooden Wonders can help make outside play into a daily "hobbit." What kid would be able to resist the allure of escaping into their own little magical world right in your backyard? 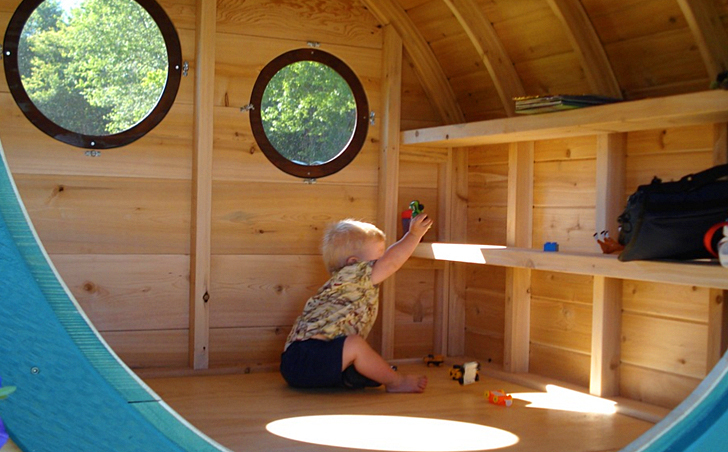 Each Hobbit Hole house is handmade in the USA out of quality materials and they can even be customized to suit your little Frodo. 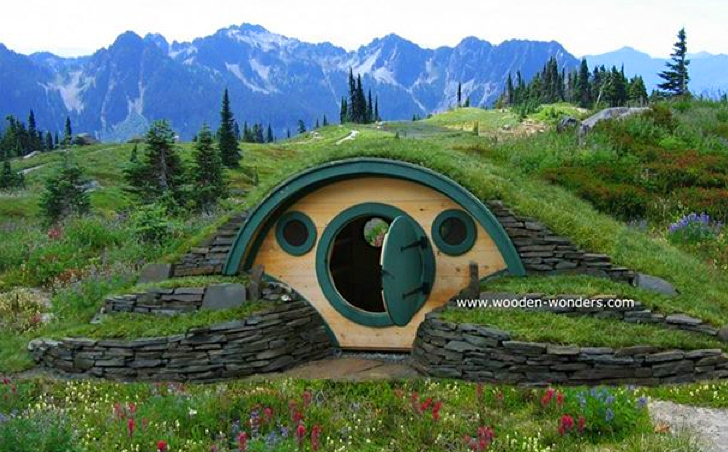 Wooden Wonders’ Hobbit Holes come in three styles – the Big Merry, the Little Merry, and the Woodshire. The Little Merry is perfect for a child’s backyard escape and offers 32 square feet of space, but the Big Merry offers a larger 60 square feet of room for bigger kids, a clubhouse or even a toolshed. Or, if you’re really pushing for an authentic Middle Earth feel, the Woodshire is the model that can actually be integrated right into the landscape like a true hole in the ground. The Woodshire is also available in two sizes – 4’x8′ and 6’8″x8. Wooden Wonders’ Hobbit Hole kits start at $1,495 and are made from quality natural materials and wood from the forests of Maine. Each one is built to order, not mass-manufactured, and can be configured with extra decorative and functional components to fit your needs. For example, add some shelves to make it a mini library for your young readers or deck it out with Victorian accents as a life-size dollhouse. The good news is that no matter what types of accents you decide on, chances are that your kids will use their imaginations to decorate their Hobbit Holes anyway! While any child would be ecstatic to receive a Wooden Wonders playhouse as a gift, they don’t necessarily need to be for kids. They also make lovely backyard retreats, offices, studios, gardening sheds and yoga studios for adults. Or if your hens are looking to upgrade, Wooden Wonders also makes some very stylish chicken coops! so cute! wish i had one as a kid! Wooden Wonders' Hobbit Holes come in three styles - the Big Merry, the Little Merry, and the Woodshire. Wooden Wonders' Hobbit Holes come in three styles - the Big Merry, the Little Merry, and the Woodshire. The Little Merry is perfect for a child's backyard escape and offers 32 square feet of space, but the Big Merry offers a larger 60 square feet of room for bigger kids, a clubhouse or even a toolshed. Or, if you're really pushing for an authentic Middle Earth feel, the Woodshire is the model that can actually be integrated right into the landscape like a true hole in the ground. The Woodshire is also available in two sizes - 4'x8' and 6'8"x8. Wooden Wonders' Hobbit Hole kits start at $1,495 and are made from quality natural materials and wood from the forests of Maine. Each one is built to order, not mass-manufactured, and can be configured with extra decorative and functional components to fit your needs. For example, add some shelves to make it a mini library for your young readers or deck it out with Victorian accents as a life-size dollhouse. The good news is that no matter what types of accents you decide on, chances are that your kids will use their imaginations to decorate their Hobbit Holes anyway! Wooden Wonders even makes custom hobbit hole chicken coops!